If you’re looking for a budget friendly promotional item or personalized gift check out this cork coaster set. 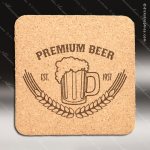 The 6 coasters can be personalized with a logo, monogram, or other graphics to create a unique and useful addition to any home, man cave, or eating or drinking establishment. They are available in 4” round, or 4” x 4” square.